So you want to learn to play piano. Great! There are literally millions of people across the world who share your interest in this awesome instrument. There are a few different approaches to how to play piano, so getting started might feel a little intimidating. But there is a simple, relatively fast way to learn how to teach yourself piano. It’s called chord-based playing, and if you want to quick results it is worth checking out piano chords. Sometimes people email me asking what the difference is between chord-based piano playing and the “normal” way. What they’re picturing as “normal” are probably traditional lessons plus lots of at-home practice. Sheet music, music theory, and either children’s songs or classical compositions. Probably years of practice before your results are enjoyable for anyone other than your built-in fan club (parents and grandparents). Does that sound about right? Lessons based on basic piano chords is about as far from all of that as you can get without actually walking away from the piano. This is a streamlined, simplified way of learning to play real, modern songs of your choice as quickly as possible. What do you have to do to play this way? You need to learn a few specific things, then apply your knowledge. From there, it’s a matter of integrating chords, bass notes, and (if you want to) melody lines. You can even add in all sorts of improvisation tools to spice things up! At this point, you’ll be able to easily play all sorts of songs, from all sorts of genres, using simple chord notation. It’s readily available online for almost any song you can think of. Chord-based playing is based on – you guessed it – chords on piano. They form the bulk of what you learn with this approach, so it’s important to understand what they are. I’ll give you a hint: Another name for chords is “triads.” As you can probably guess from the name, the number 3 is significant here. Why? Because most of the time, chords are made up of 3 notes! So now the real question is, which 3 notes make up each chord? Because let’s be honest: Pressing sets of 3 random keys at a time probably isn’t the most efficient way to learn chords. Fortunately, we don’t have to do that. Chords combine notes that sound good together, so they aren’t random. Some people try to memorize all of the most common chords, but that’s a lot of work. Trying to learn to visually place so many different key combinations is daunting. The simpler way relies on a few easy formulas. That’s right, even in music you can’t escape math. The formulas will make your life a lot easier once you learn them – no long lists of chords to memorize and no trying to puzzle out individual chords. For example, let’s look at major chords. They have a bright, “happy” sound to them because of the combinations of notes they use. The formula for major chords is 4-3. To find a major chord – say, C major – you need to start with the root note and then count “up,” to the right. The root note is the note the chord is named after, in this case C.
Is your thumb on C? Okay, great! Now count 4 keys to the right. Put your pointer/index finger there. Now count 3 more keys to the right and put your middle finger there. Press down on those three notes, and there you have it: a C major chord! Before moving on, I want to make sure you don’t get confused about an important point. The formula I just explained is simple, but sometimes people can’t quite seem to get it right. That’s usually for a very specific reason: forgetting about the black keys. Those black keys may look different than the white ones, but the reality is that they are only different in how they appear on your keyboard. It would be confusing (and unwieldy) to have a long keyboard with all white keys. Hard to orient yourself, and hard to find your way around. Those black keys are great visual markers that will help you find the notes you need each and every time you play. They matter, and they should be counted just like white keys. So, every time you use a chord formula, make sure you include the black keys when you count. The 4-3 formula works for any major chord. And other types, such as minors, 7ths, and more all have their own formulas. It’s as simple as knowing your notes and knowing how to count. Don’t worry. Formulas are a building block, not the be-all and end-all. Imagine you are building a house. You would never argue with the builders about whether your house needs a floor, walls, or a roof. You wouldn’t expect to innovate something completely different at that level of the building process. Those boring parts are necessary components of any house. But once all the basic parts of the structure are built, you have a lot of customization options. Paint colors, woodwork and moldings, and much more are completely up to you. That’s what it’s like when you play piano, too. All piano chords – based on formulas – are the main structure that holds each song together. The extra flourishes you add in later? They’re up to you. One of the nice things about playing chords is that you can easily change octaves to adjust your sound. Let’s take a look at what octaves are and how you can use them. This works even if you’ve only played piano for a short while. All along your keyboard, groups of 8 white keys exist. They are called octaves, and each octave has the same notes – just with a higher or lower sound. To help you understand this, try a simple exercise. Find your middle C note and play it. Now count 8 white keys to the left. Hear how the sound is the same except lower? You’ve just switched to a lower octave of the C note. Count down (to the left) by 8 more white keys. Play the note, and you’ll see that once again, the note is the same, but lower. You can do the same thing by switching to the right, and hear how the sound becomes higher. Every time you move in either direction by 8 white keys, you are changing octaves. What’s the point? Well, moving to lower octaves is a great way to add a more serious or dark sound to your sound as you play. Moving to higher octaves does something different: it can make things more light-hearted or even more emotional. With a simple repositioning of where you play, you can add a lot of nuance to your sound. A lot of songs really benefit from an octave change during the bridge or for added impact when repeating a chorus. It’s a simple, but very effective technique. Remember our construction from a while back? I mentioned that adding in extra flourishes is up to you. I know that can sound intimidating, but I promise that it’s not as hard as you might think. Before I can talk about what improv is, I need to clear up what it is not. That’s because a lot of people have a flawed picture in their minds about what it means to improvise. For our purposes, improvising is not just randomly adding in notes or making up new parts of songs off the top of your head. Improv isn’t guesswork. It’s the successful application of specific tools to a set of information you already have (in this case, chord notation). It’s adding your own flourishes or adaptations in a way that fits the overall structure. Those are probably the most popular and easy to learn options, so they’re a great place to start. While it would be hard to get into all the details in one post, my 21-day course has several lessons specifically focused on how to play piano improvisation. Building up an improvisational toolbox is an exciting part of chord-based piano learning. When you start incorporating this into your practice, you’re going to be pleasantly surprised how it levels up your sound! When I was young, I spent 12 years learning piano the traditional way, but my results were never really something I could be proud of. I didn’t know how to play new songs without studying their sheet music for a long time. And don’t even get me started on how I couldn’t play a single song by bands I actually liked! 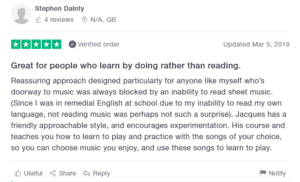 That’s why learning about chord-based playing came as such a shock to me. I suddenly realized that this information could have cut my studies down to a fraction of their duration, and give me more enjoyable results! The simple fact of the matter is that chord-based playing is simpler. And it makes sense that things that are simpler to learn shouldn’t take as much time. That’s certainly been true for the majority of my students ever since I created Piano In 21 Days. The name says it all: 21 days. Going through my 21 lessons is all it really takes to start playing real songs with my chord-based approach. Not everyone wants to go through the lessons in 21 consecutive days. People lead busy lives, and sometimes they might only have time to practice once or twice a week. That’s fine, but the fact remains that people can and do successfully learn chord-based playing in 21 days. This is one of the many reasons that chord-based playing holds so much appeal. Honestly, most people would be thrilled to make that much progress in 21 weeks, or even 21 months. Remember, I and many others like me have spent years and years on traditional lessons with little to show for it. If time is money, we sure have wasted a lot of both. The thing that gets me most excited about chord-based playing is that it works. And not just for me, a person who technically already a lot of piano lessons in my past. This approach to piano works for the complete beginner, and I have the testimonials to prove it! 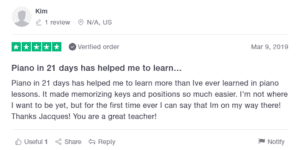 You can also head over to my Testimonials page for videos and more reviews from successful students of mine. Is Chord-Based Playing Piano Your Best Option? Does that sound like you? If so, you are in the right place and I have a free resource to help you get started. My free 5-day workbook can be yours to keep forever – and I hope you’ll stick around for my full 21-day course!